After Summer on Gradina, Rijeka Summer Nights and a host of other happenings that turned streets and squares of Rijeka into stages and entertainment venues, Rijeka 2020 – European Capital of Culture now comes into the fold to help conceive and organise events this summer. Summer in the City will take place from mid-June to mid-September and will feature a series of events that will bring together well-known summer events typical for Rijeka and introduce many new festivals, concerts, film projections, plays, exhibitions, performances and lectures. 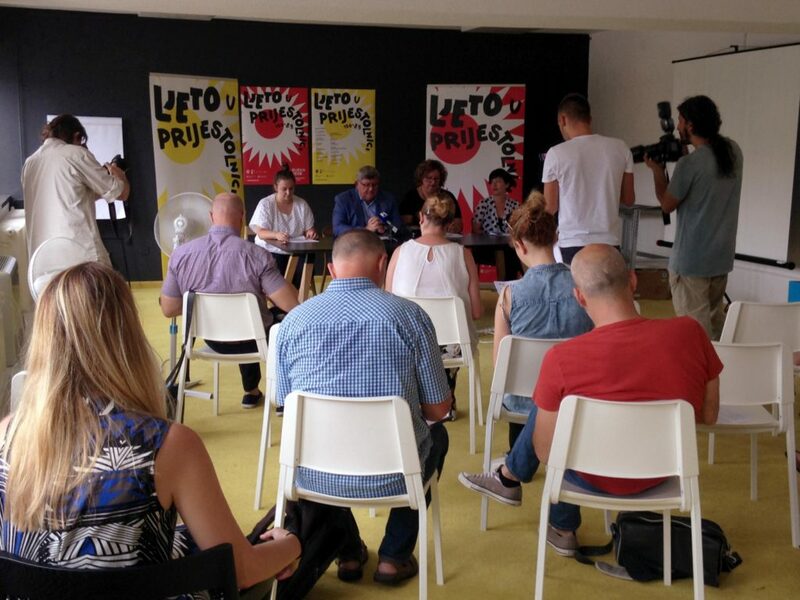 The news was presented during a press conference on Wednesday, 13 June by Vojko Obersnel, Mayor of Rijeka, Emina Višnić, Director of TD Rijeka 2020, Jelena Milić, Coordinator of Brick House Rijeka 2020 and Lela Vujanić, Programme Manager of The Kitchen. “There has been an increasing number of summer events for citizens of Rijeka and visitors alike, so an initiative emerged to put them all together under the same roof. For the “roof”, we took The European Capital of Culture project, through which we are currently intensively preparing for 2020, but which also includes many pre-programmes until that time. 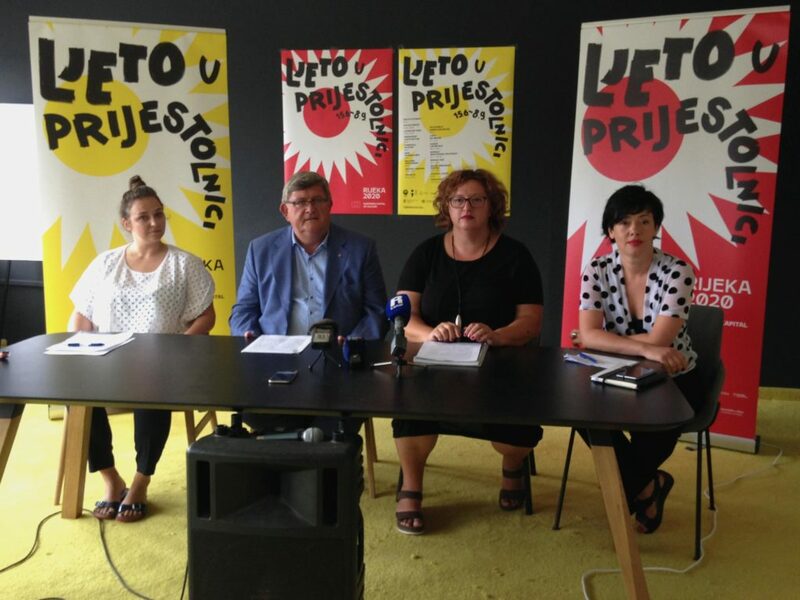 In this context, the Summer in the Capital was conceived to include some already existing programmes and partners such as Rijeka Summer Nights organised by the Croatian National Theatre “Ivan pl. Zajc” (28/06 – 18/07), Summer on Gradina (07/07 – 02/09), Summer Art Cinema (15/06 – 27/07) and Summer School by the Center for Advanced Studies of South East Europe at University of Rijeka (18/0622/06), and some new programmes as well”, Obersnel explained. Since as many as 40 programme and project partners joined forces to develop and organise the programmes, Emina Višnić was happy to be able to invite everyone to “a summer-long get-together with culture” that will take place at the many locations on the streets of Rijeka, thanks to the City of Rijeka as the holder of the Capital of Culture title. “This summer, we have focused on the area of Delta, i.e. this very building located at the address Delta 5, Exportdrvo and various other locations that have been covered by the Sweet & Salty programme, featuring the area where fresh water of the Rječina river enters the sea. The Port Authority Rijeka is an important partner as well, letting us use the facilities that are not often put into such use, which makes the programme even more appealing”, Višnić stated. The first event in the Summer in the Capital series is scheduled for 15 June, with a concert by Punčke at Delta 5 as part of a new musical series Ciklus Furioza . Entitled Open Delta, the local building situated at this address will open its doors before the concert, which will commence at 9.30 p.m. Visitors will mingle with the building’s occupants side-by-side with a gastro offering. On the occasion of the Anti-fascist Struggle Day in June, the square Titov trg will host a musical performance by Zbor crvene Rijeke (Rijeka Red Choir) on 23 June, while a theatrical performance Welcome at Kantrida Swimming Pools on 26 June will send a strong message about the refugee crisis. From 27 June to 28 July, Slide Festival – Active Holidays for Children will be scattered across multiple locations in Rijeka in joint organisation by Art-cinema, City Puppet Theatre Rijeka, MMSU (Museum of Modern and Contemporary Art) and Youth Council Benčić. The festival will open with an “insect invasion” on the stretch from Trg 128. brigade Hrvatske vojske to Exportdrvo on 27 June at 8 p.m.
A series of art interventions entitled Spajalica (Paper Clip) will be presented in public areas of Rijeka and the 2nd Biennial of Industrial Art will present more than 20 local and international contemporary artists in Labin, Raša, Pula, Vodnjan and at the Rijeka MMSU (Museum of Modern and Contemporary Art), beginning on 20 July. From 21 June, Rijeka will also host EASA, the most important conference of young architects, while a new music festival Sailor Sweet&Salt will take place on 27 and 28 July at locations Ex Port Delta and Torpedo, organised by Klub ljubitelja buke (Noise Fan Club). August, the summer’s warmest month, has two exceptional music events in store: the Chelsea Wolfe & Brutus concert on 1 August at Trsatska Gradina and a concert by the famous Americana band Calexico, which will be held on 13 August with My Buddy Moose as the opening act. Summer in the Capital will end with the second edition of the Porto Etno Music and Gastronomy Festival on 7 and 8 September, at the Exportdrvo building, with performances by numerous international Ethno-Jazz musicians, followed by a gastronomy fair organised by various minorities and friendship associations from Rijeka and Primorsko-goranska county. Summer in the Capital is under the patronage of the City of Rijeka, Croatian Ministry of Culture, Rijeka Tourist Board, Primorsko-goranska County, Croatian Ministry of Tourism and University of Rijeka.